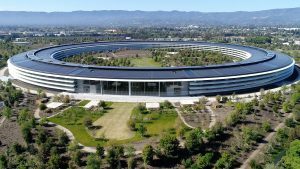 The newly completed "Spaceship" Apple headquarters building will hold 13,000 employees in a 2.8 million square-foot main building stretching almost one mile in circumference. 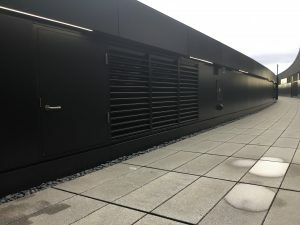 CMF modeled and installed nearly 2 lineal miles (100,000 square feet) of insulated and sound-attenuated Trimo metal panels (imported from Slovenia) on the plant level of the building. CMF had to start with GPS coordinates to determine gridline points and then use laser scanning and mathematical formulas to establish correct panel locations. 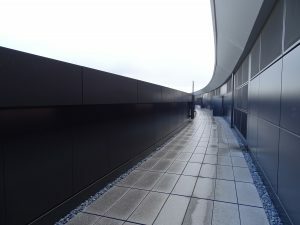 Panels were to be installed on a radius, yet the supporting structural steel beams were straight. Brackets needed to connect each panel had to be individually laid-out, custom designed and fabricated for each panel. 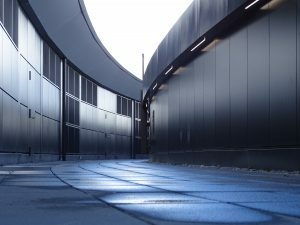 This layout differed between inner and outer areas since the outer panels were installed on a concave radius and the inner panels were installed on a convex radius. 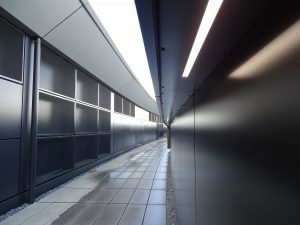 Ninety-six hundred lineal feet of custom .125 aluminum peak and eave copings and light troughs (manufactured by CPS) were modeled and installed around the circumference of the building. 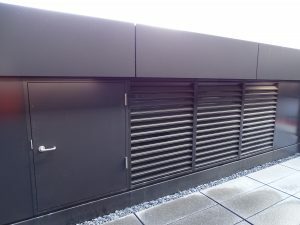 Construction Specialties louvers were installed throughout the breezeway. 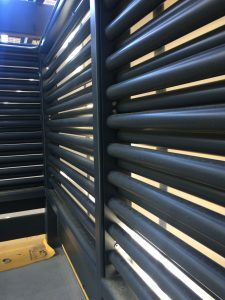 Strict tolerances were required for all parts. 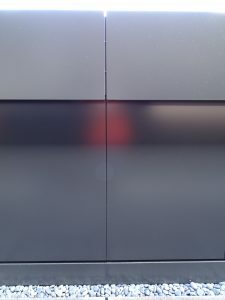 Shown are peak fascia panels, Trimo insulated panels and bottom flashing. 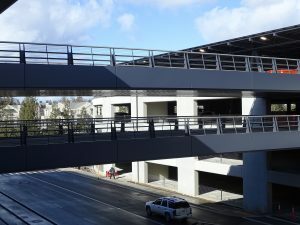 Construction Specialties light-glare aluminum rod cladding was installed on both parking garages. 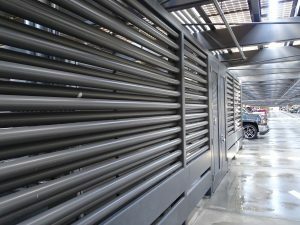 Twenty-two thousand square feet of Elward ACM panels were installed on 6 bridges connecting the two garages. The bridges were designed to have a 9-inch camber prior to pouring concrete and installing steel. The theoretical dead load would result in a 6-inch camber. 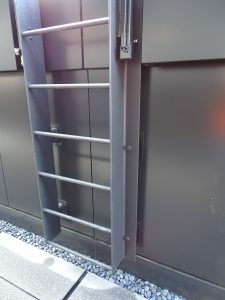 CMF needed to design and engineer a trapezoidal ACM panel that would allow for this deflection, but still maintain the tight tolerance demanded by Apple. 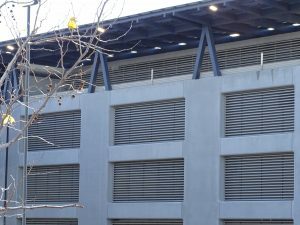 The parking garages involved 51 miles of steel purlins which CMF personnel drilled and bolted together in its shop, shipped to the jobsite, craned into place and installed with electrical trays and other accessories needed for the solar panels. 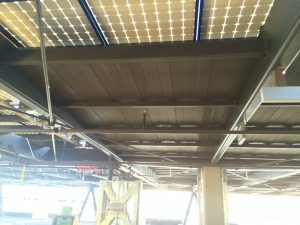 Construction Specialties aluminum PV Inverter tubes installed at the parking garages.